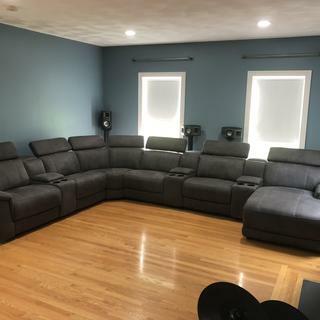 The Slater Sectional in ultra-soft charcoal gray is the ideal seating arrangement for your entertainment haven. 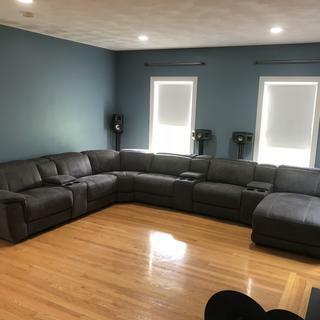 This plush sectional features power headrests on every seat that retract when not in use, creating a sleeker silhouette. On one end, two seats recline at the touch of a button while at the other end an oversized chaise is ideal for constant lounging. The console features hidden storage for remotes and two cup holders. A USB port located on the control panel ensures all your devices stay charged. Custom-order fabrics are available. 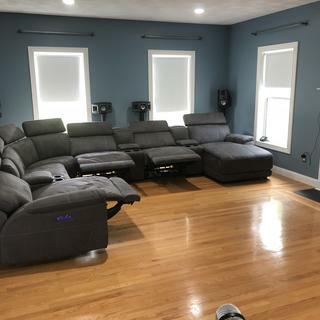 Comment: Includes: Power Left Arm Facing Recliner with Power Tilt Headrest, Power Armless Recliner with Power Tilt Headrest, Armless Chair with Power Tilt Headrest, Corner with Power Tilt Headrests, Console and Right Arm Facing Chaise with Power Tilt Headrest. Price may vary based on option(s) selected. We’re sorry that you had an issue with delivery, and we want to assist you. A customer service team member will be contacting you via the email address we have on file. Our team members can also be reached by calling 866-856-7326 and we’ll be happy to help. Great modern design, power everything, easy to rearrange or expand. Are there other color options? 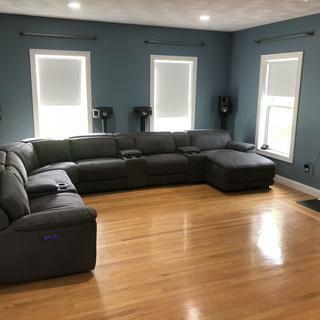 The Slater Sectional is available in many different color options. Please visit any of our Retail Store locations to view all of the options. How tall is it with the headrests up and down? The height of the seat back with the headrest down is 32" and 41" with the headrest up.